In 2011 we ventured abroad for our annual big bike ride. 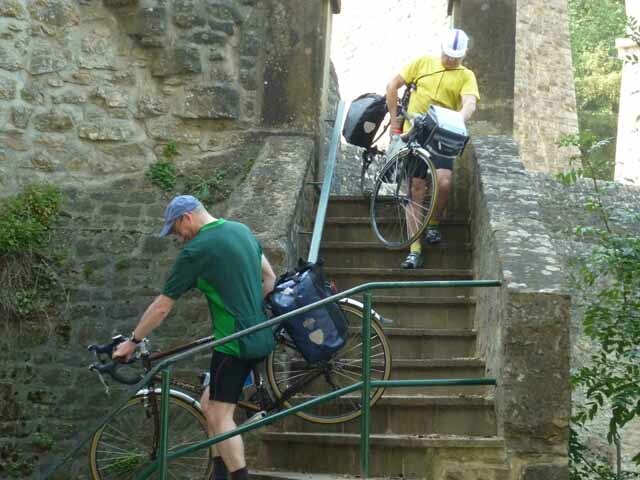 Paul had had the idea of a ride which took in 5 countries (France, Luxembourg, Germany, Belgium and the Netherlands) for some years, but the difficulties in arranging the transport and accommodation had put us off in the past. This year we got it organised, with Jim doing the transport and accommodation bookings, and Paul planning the route (as usual). The aim was to cover about 70 miles per day, and taking four days rather than our usual three. 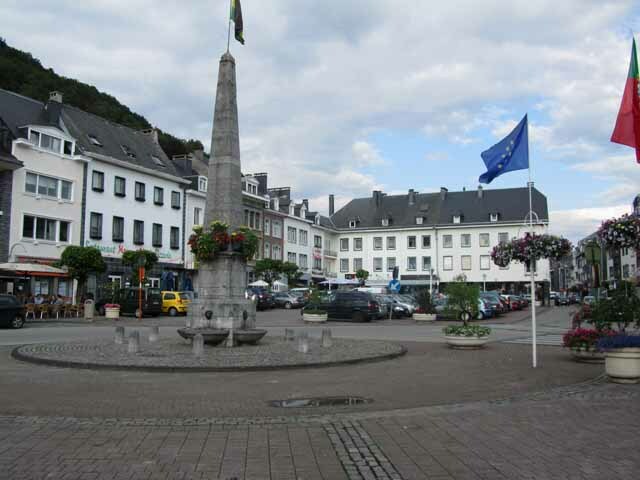 The route that we settled on started at Luxembourg and finished in Brussels, with overnight stops in Vianden, Malmedy, Maastricht and Mechelen. There were just four of us on this trip: Paul, Jim, Brent and myself. The day was spent travelling with our bikes, from York to Luxembourg. We took the 06.58 from York to King's Cross, then walked across the road to St Pancras to check in our bikes at the EuroDespatch office. The "same train" service puts your bike on the same train that you travel on, for a fee of £30 each way. We then had some time to spare, so we went to the Betjeman Arms on the station for a disgracefully early beer (it wasn't even 10 o'clock). The 10.57 Eurostar sped us to Brussels, and we were able to pick up our bikes on the platform. We bought tickets for ourselves and bikes to Luxembourg, and caught the train at 15.33. The train was formed of double-deck stock and had plenty of space for bicycles. 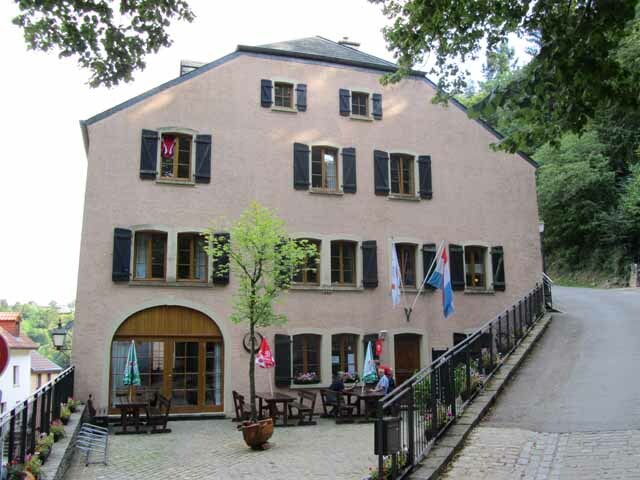 We cycled the short distance to the Luxembourg City Hostel, a large, modern and busy hostel. It had a restaurant, and the menu and prices looked good, so we had our evening meal there, then walked into the old part of the city for a beer or two. Breakfast was included in the price of the hostel, so we were able to fill our faces before starting the ride. A map at the hostel showed a traffic-free cycle route out of the city in the direction we wanted, so it was an obvious choice for us. We set out at 9 o'clock, and Paul had suggested a particular route which would avoid steep hills and link up with the cycle route. Unfortunately it didn't avoid road closures, and we had to walk with our bikes along the footpath where the road had been dug up. That wasn't the end of it, as a bit further on there was more redevelopment work, and the only escape seemed to be a footpath which led onto the city walls. We ended up carrying our bikes down steps to get down to river level and the start of the cycle path. Once this obstacle course was over, the riverside cycle path was a real joy. It took us southeast of the city and ended at Hesperange where we joined the N3. Here were had a surprise: where the cycle path met this road, traffic on the main road stopped to let us cross! We continued on the N3 towards the French border, and we knew we were nearly there when we passed through Frisange, a village consisting mostly of petrol stations (it's about 20 cents per litre cheaper in Luxembourg than in the surrounding countries). We paused for photos at the first of many border crossings on this ride, then rode along some quiet French lanes for about half an hour before crossing back into Luxembourg. 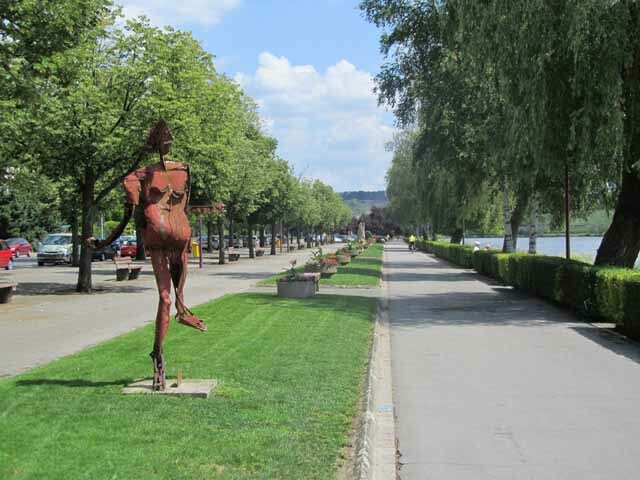 A fast descent brought us down to the Moselle, and we joined the riverside cycle path and followed it to Remich. 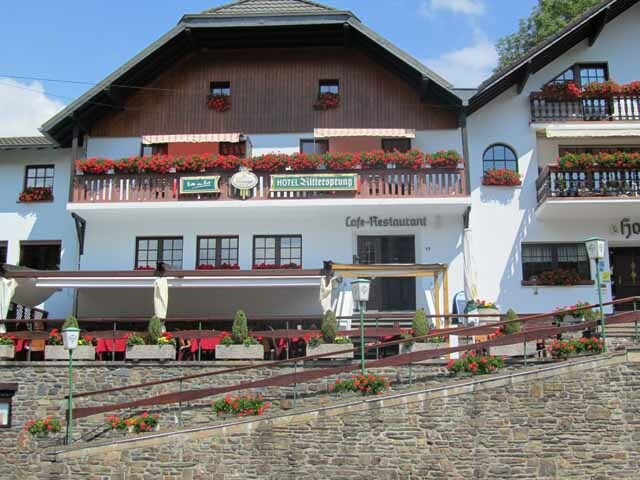 We had a break for coffee in Remich. The river here forms the border between Luxembourg and Germany, and our original plan was to cross here and cycle on the German side as far as Wellen, but as there was a good cycle path we decided to stay on the Luxembourg side. At Wasserbillig the border turns to follow a tributary, the Sauer (Sûre in French) and we crossed onto the German side. There was a shock to our sensibilities at Langsur where we were faced with a pair of bare buttocks. A young woman was crouching down, answering a call of nature in full view of the cycle path. These continentals have no inhibitions. We were all too shocked to be able to take any photos. Again there was a good quality cycle path close to the river, and it later became clear that this was an old railway line, which included a short tunnel just after Ralingen. 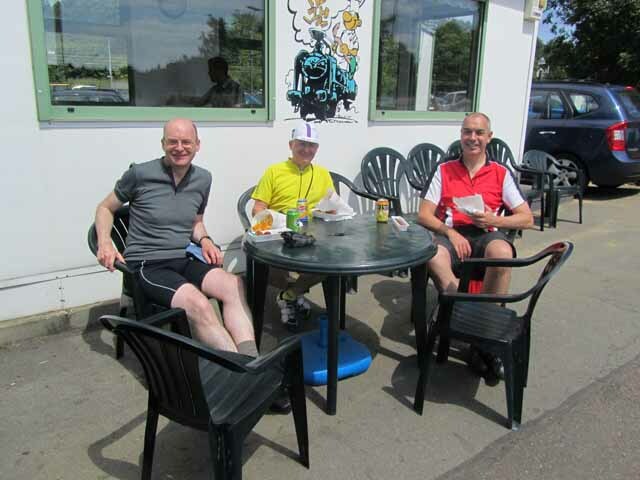 We had been looking out for a suitable lunch stop for some time, and when we found a place at Minden it was too late. They had stopped serving food, so we had to make do with a beer instead - a very refreshing Paulaner Weissbier. A little further on, at Echternacherbrück, there was a shop with seats and tables outside, and we were able to get a late lunch here. We had by now left the cycle path and were following minor roads, and had a hill to climb after Bollendorf before dropping back down to river level at Wallendorf. We crossed the river (back into Luxembourg) at Roth, just before our destination for the day, Vianden. The final sting in the tail was that the Youth Hostel was near the castle, giving us our steepest hill climb of the day right at the end. At the hostel the four of us had an 8-bed dormitory to ourselves. We walked down the main street of the attractive, small town and found a restaurant where we could sit outside (except for Paul, who had to make do with the veggie food he'd brought with him). We reflected on what a good day it had been - good weather, good cycle paths, few hills, no punctures, and we didn't feel as though we'd cycled 80 miles. The second day of the ride, from Vianden (Luxembourg) to Malmedy (Belgium) was the shortest, but hilliest, stage. We started riding at 9 o'clock again, in cool but sunny weather. The first hour of the ride followed the River Our northwards, on a gently undulating road. We crossed the river at Dasbourg-Pont and entered Germany again, climbing steeply out of the valley through Dasburg. After half an hour on the plateau, we dropped back down towards Ouren. At some point on this road, we crossed into Belgium, but we didn't see any sign marking this. Border crossings just aren't the same these days. We called in at a hotel in Peterskirche for coffee/tea/hot chocolate, and noticed that German seemed to be the language spoken here. We sat outside, but a few spots of rain forced us to move under the cover of a canopy. The rain didn't amount to much, and we continued northwards, but half an hour further on, as we were climbing uphill through Bracht, we were forced to shelter from a heavy shower. We carried on along wet country lanes, through Lommersweiler, and arrived in St Vith, where we stopped for lunch. A navigational error saw us heading in the wrong direction out of St Vith for 2 miles, and we had to retrace our tracks back through the town to get onto the road to Amel. This was a fairly busy road, but after a few km a shared cycle/foot path appeared on the other side of the road, so we crossed over to it. All was going well until we got to a side road on the approach to Amel. It was downhill, and we were going quite fast, but the red colouring of the cycle lane was continuous across the side road, the give way markings on the road were set back, and it looked as though we had a clear run across. We realised too late that there was a raised kerb, which we all hit too fast for comfort. Luckily there didn't appear to be any damage to wheels or tyres. Another shower caused us to shelter under a tree in Amel for 10 minutes or so, then just beyond the town the rain came on again, so we all took cover in a bus shelter until it passed over. On the road to Waimes, we crossed the linguistic boundary, into the French-speaking part of Belgium. 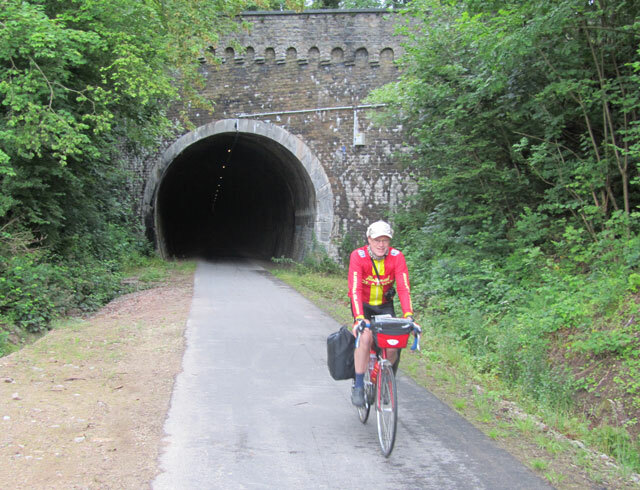 Passing through Waimes, we spotted a cycle track to Malmedy, but as we were making good progress on the road, we (foolishly) ignored it. Blackening skies told us that heavy rain was imminent, so when we saw a bus shelter, we took cover, but this time the rain lasted for 45 minutes. When we set off again, the roads were wet, the traffic was heavy, and we got soaked in spray. 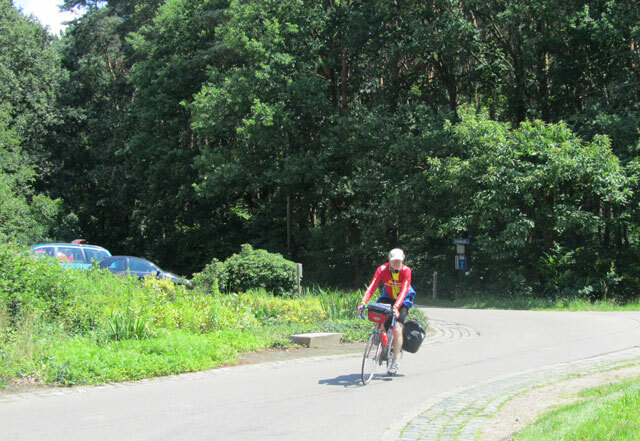 Just before Malmedy, a cycle track crossed the road, and we gladly took it to escape the heavy traffic. It took us to the old station at Malmedy, and it was clearly an old railway route which we could have followed from Waimes. The youth hostel was a few km beyond the centre of Malmedy. We were in a 4-bed room, which was "cosy" - there wasn't a lot of space between the top bunks and the ceiling, and the décor, well, there wasn't any, just bare breeze block walls. But it would serve our purpose as a bed for the night. We took a taxi back into town, and from many cafés and restaurants we chose to eat at one called La Forge. It turned out that they weren't doing food (despite having a blackboard with a menu outside), and the barman made a gesture suggesting that the chef had fallen over (dead? drunk?). We had a drink there anyway, our conversations periodically interrupted by a loud, wailing cry from a woman behind the bar. Shades of Fawlty Towers here. We moved on down the road to another restaurant, where we were able to get some food. 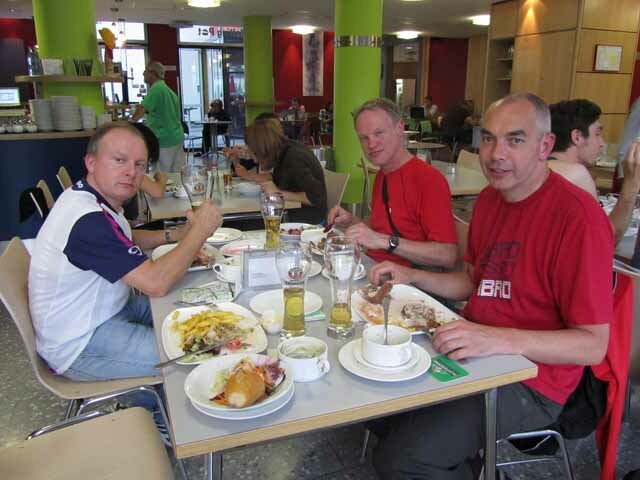 Paul made his own arrangements, and had a walk around the town while the rest of us enjoyed a leisurely meal. It was too leisurely for Paul's liking, and he tired of waiting for us, so returned to the hostel. We moved on to a bar, where various members of a brass band (which had been playing in the town earlier) had settled, and kept breaking into tunes. The range of beers available at this bar was fairly limited, so after one drink we made our way to the Scotch Inn on the main square, where the beer menu was more like we hoped to find in Belgium. We remained here until midnight (there was brass band accompaniment here too), then walked back to the hostel and had to wake Paul up to let us into our room. It was quite misty when we awoke, but by the time we'd had breakfast the sky was brightening. It was still quite cool when we set off just after 9 o'clock, retracing our route back through the town to the old railway station, where we re-joined the cycle path. The path had a good surface, and was a good find for us as the alternatives would have been either a busy main road following the valley, or a very hilly route on minor roads. The path included a tunnel at Stavelot, and ended at Trois-Ponts where the old railway had a junction with the Liège to Luxembourg line. Our route continued on the N633 following the River Amblève. The road was not too busy, but the condition of the road surface was dreadful. Before long the road left the valley and began a long climb up to the small town of Stoumont. A long descent followed, but had to be made with some caution due to the poor surface. When we reached the bottom, we realised that Brent was no longer with us, so we stopped by the railway to wait for him. After a few minutes Brent called to say that he had punctures in both tyres. He only had one spare inner tube, so would have to repair one, and would take some time. We thought about cycling back up the hill with another spare tube for him, but we couldn't establish how far back he was, so decided to wait. Then Paul noticed that his back tyre had gone flat, so he had to change an inner tube. We hung around for over an hour, and started to feel cold, so decided to cycle back up the hill to warm up. 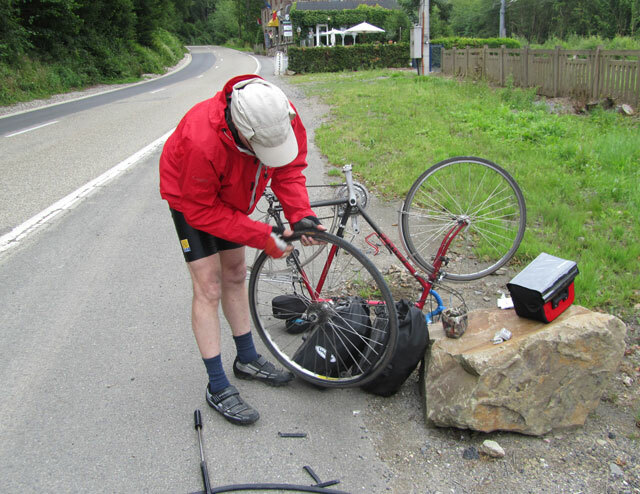 We came across Brent by the side of the road after about 3km, and Paul was able to give him another spare inner tube so he could use that instead of the one he had just repaired. A few km further on, just before Remouchamps, a spoke broke on Jim's back wheel, no doubt another consequence of the "Route Dégradée". We stopped to try to straighten the wheel, but without much success, so decided to carry on at low speed to Remouchamps and see if we could find a bike shop. It was clearly a popular area for cycling, so we thought there would be a good chance of finding a shop. Jim went into the tourist information office in Remouchamps to ask, and came back with the news that the nearest bike shop was in Aywaille, 3km further down the valley. His wheel survived the journey there, and the shop was able to replace the spoke and true the wheel straight away for just 7.50, which we thought excellent value. Jim had half expected to have to end the ride here, and finish the journey by train, and we considered ourselves lucky that we hadn't had a major breakdown yesterday, when we would have been many miles from the nearest bike shop (or railway station) for most of the day. We had lunch in Aywaille, in one of the many pavement cafés in Place Joseph Thiry. We must have lost about 2 hours due to bike problems, but we were nearly half way to Maastricht and the rest of the day should be fairly easy riding. A woman asked where we were going, and told us to go via Sprimont, something to do with the road being closed. That would be a hilly route, so we ignored her and set off on the main road along the valley. There were signs warning of a road closure ahead, but past experience has taught us that it is usually possible for cyclists and pedestrians to get past road closures. 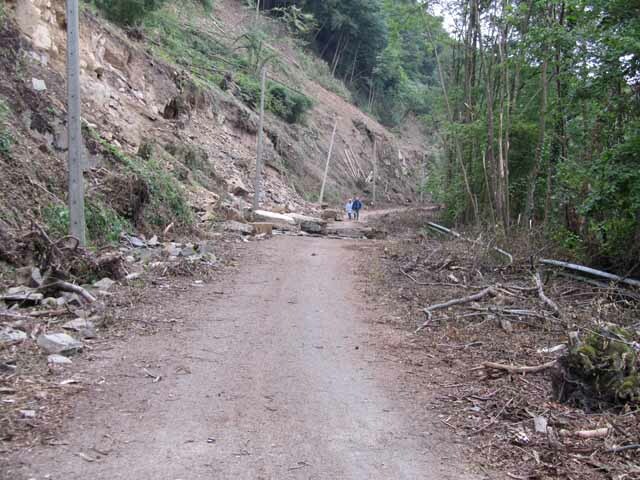 There had been a massive rockfall from a cliff above the road, but we were able to get past easily, and then we were able to enjoy riding along a main road with almost no other traffic. From Pont de Soay, where the rivers Amblève and Ourthe meet, we followed a cycle path on the right bank of the Ourthe as far as Chanxhe, then rejoined the N633, now busier with traffic, through Esneux to Tilff. From here, we would be on a designated cycle route all the way to Maastricht. We followed the left bank of the Ourthe to Liège, where it joins the River Meuse. 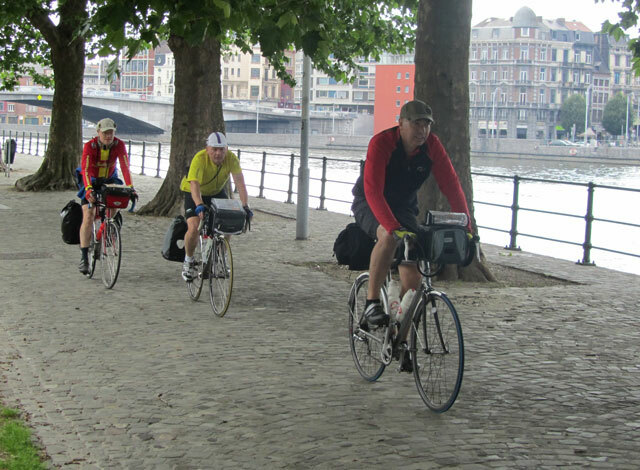 The cycle route continues along the Meuse as it passes through Liège, first on the right bank, then on the left. Some sections were on cobbled stretches of road, which were not very pleasant. 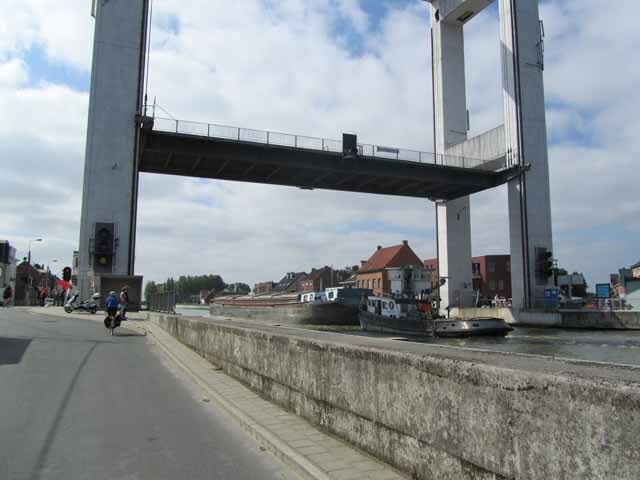 Beyond Liège, the route takes the Albert Canal, with lots of heavy industry all around. The north wind was still blowing, and was more noticeable now that we had left the shelter of the valleys. There is a junction in the canal just before the Dutch border, and here we took the right-hand branch which links back up to the River Meuse/Maas. From here, the cycle route left the waterway and followed roadside cycle tracks into the centre of Maastricht. There was no sign at the border to mark the arrival in our fifth and final country, but a "Maastricht" sign probably indicated its position. Our base for tonight was the Golden Tulip Hotel, to the northeast of the centre of town. Although the youth hostels had been quite good, it was nice to have a bit of luxury for one night. After showering and changing, we got a taxi into the town centre. Paul had his DIY veggie meal as usual, but the other three of us ate at a restaurant in the main square, Vrijthof. The waiter guessed that we were from Yorkshire, from our accents, even though he'd never been there. Later, we went to a small bar for a couple of beers - Belgian ones. The riverside route through Liège. Not the best surface for cycling. 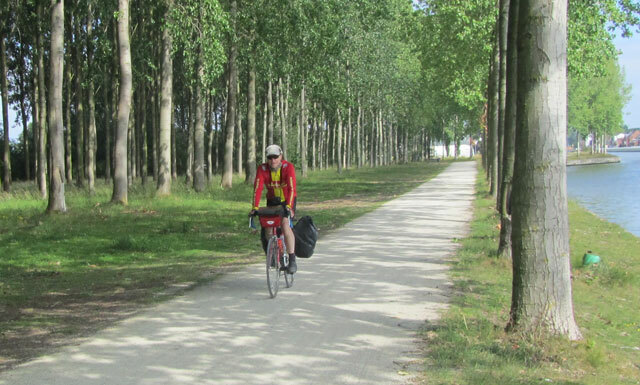 On our last full day cycling, we would head west through Belgium to our final overnight stop in Mechelen. I couldn't help thinking that today it may be my turn to have a breakdown of some sort. It was bright and sunny, but still with a bit of a chill in the air, when we left the hotel at 8.30. Breakfast at the hotel would have cost an outrageous €18.50, so we headed for the station where we thought there may be a café open, but there wasn't (it was a Sunday). There was, however, an Albert Hein supermarket selling sandwiches, pastries and drinks, so we were able to get an adequate breakfast here, which we ate on the station platform. 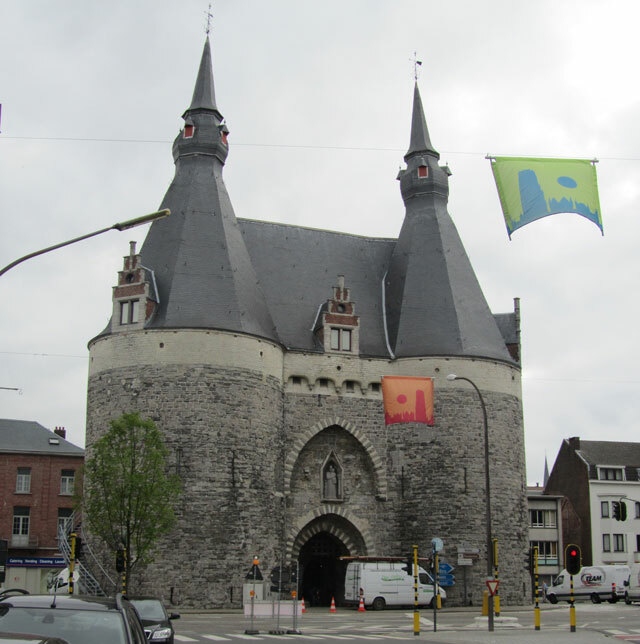 We set off through the centre of Maastricht, then out onto a main road heading northwest to the Belgian border. Although it was a main road, there was a separate cycle lane so we weren't amongst heavy traffic. Shortly after crossing our final border back into Belgium, we took a minor road leading towards Gellik. We crossed the Albert Canal and noticed there was a cycle path alongside, which we could follow as far as the next bridge. 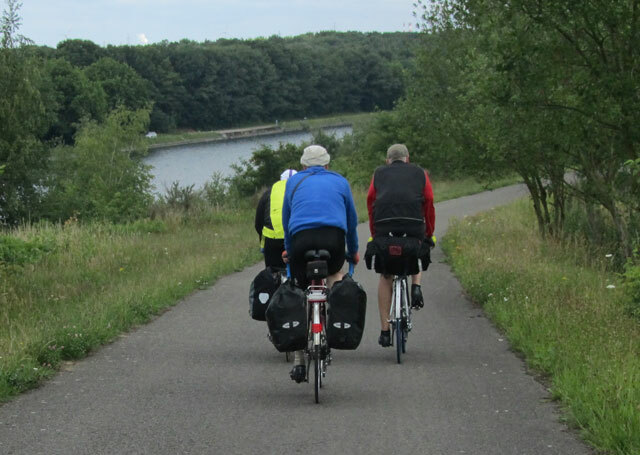 Then we carried on by road through Munsterbilzen, Bilzen and Diepenbeek to Hasselt. This last section was on the N2, a fairly busy road, but with a cycle lane. Unlike in Britain, where users of cycle lanes often have to give way at junctions with side roads, or they end where the road becomes too narrow (just where you need them most), here the cycle lane was almost continuous, so we made good progress. 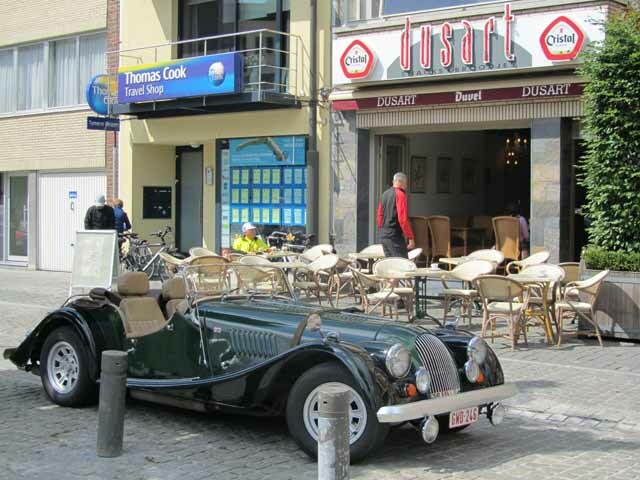 We stopped for coffee or tea in Hasselt, where there was a classic car show taking place. A "Hit fm" radio station bus was parked in the square, and Jim discovered that they were giving away free food. Even though it was a bit too early for lunch, we couldn't let this opportunity go by, and after all, we hadn't had a proper breakfast. So Jim, Brent and I queued up for a helping of new potatoes in a white wine and bacon sauce. Once we had found the route out of Hasselt, we progressed westwards through Kermt, Lummen and Meldert. We took a narrow lane between Meldert and Diest which gave some very pleasant cycling, but we missed a turning and ended up taking a longer route than intended. Diest was a convenient place to stop for lunch. There was a good choice of outdoor cafés in the centre, but Jim had set his heart on sampling some Belgian chips, or frietjes as they are known in these Flemish-speaking parts. He asked a passer-by where we could get some, and he directed us to the railway station, which we had passed on the way into Diest. We found the "Frituur bij Warke" (Warke's chippy), Paul established that they were fried in animal fat and therefore not for him, and the other three of us ordered a medium portion each. "What sauces have you got? ", I asked, and the guy reeled off a list of about 20, Two Ronnies-style. I recognised Andalus among the list (I've had it before) and went for that. Our ride continued through Zichem, Testelt and Langdorp to Aarschot, where we paused for an afternoon cup of tea. The route onwards from here became increasingly built-up, until it was continuous suburban sprawl. We continued to ride along cycle lanes, but these are often made from concrete slabs which give a regular bedunk, bedunk, bedunk as you ride over the joins. It gets a bit tiring after several hours. On arrival in Mechelen there was some confusion over where the youth hostel was, but we found it just before six. We were thrilled to discover we had a room with a view of the railway! We ate at d'Afspraak, a nearby restaurant recommended by the hostel. It had a large choice of beers and we were tempted to stay longer, but thought we'd better look around the town before it got dark. We walked to the main square (Grote Markt), where a fairground had been set up. The town is very attractive, but we had more beers to sample so we found another bar, Den Stille Genieter, which claimed to have over 300 beers. We found that not all beers listed on their menu were available, but there was still an impressive choice. Just a short run south to Brussels today, before catching an afternoon Eurostar back to London. After breakfast at the hostel, we hit the road at our usual time of just after 9 o'clock. We followed the inner ring road round to the southwest side and crossed the Leuvense Vaart canal on a bridge which was closed to motor traffic due to roadworks. On the far side of the bridge we should have taken the Hombeek road, but we took a road not shown on our map, and ended up in a park. Here we found a map of local cycle routes, and it explained all the numbered signs we had seen yesterday, which we thought were cycle route numbers. The numbers actually refer to "nodes" at the junctions between sections of route, the idea being that you build up a route as a list of nodes to pass through. As you reach each node, you simply follow the sign pointing to the next node on your route. We worked out that to escape from the park, we could head for 92 then 59, which we did. This took us a little bit out of our way, but gave a pleasant ride alongside the River Zenne. We regained our planned route at Hombeek, then headed southwest to the Brussels - Schelde Canal at Humbeek. The bridge was raised for some barges to pass, so we had to wait before crossing to the cycle track on the west side of the canal, which we then followed all the way to Brussels. The area became increasingly industrialised as we passed through the outskirts of the capital, and eventually the cycle lane just petered out and we found ourselves cycling along a busy road on a cobbled surface. We decided to try the road on the other side of the canal, which initially wasn't much better, but later we got onto a decent canalside path once more. Signposting of cycle routes seemed to be completely non-existent here. When we reached Rue de Liverpool we could see the tower block outside Midi/Zuid station, so we used that to guide us to the end of our ride. Paul went off in search of veggie food (and paid a visit to Cantillon brewery), while the other three of us checked our bikes in and had lunch in a café near the station. We were joined by a friend of mine, Bill, who lives in Brussels (and features in most of the train journeys described on this site). On returning to the station, we had two problems. First, we were told that our bikes could not go on the same train as us, as all the space was required for a tour group with a lot of luggage. Our bikes would follow on the next train, 1½ hours later. We protested strongly, as we had made the reservations as soon as bookings opened 3 months earlier, and it seemed we were being bumped off to make things easy for Eurostar. It would cause us further problems, as we would miss the 17.00 from King's Cross to York, which we had reserved our bikes on. 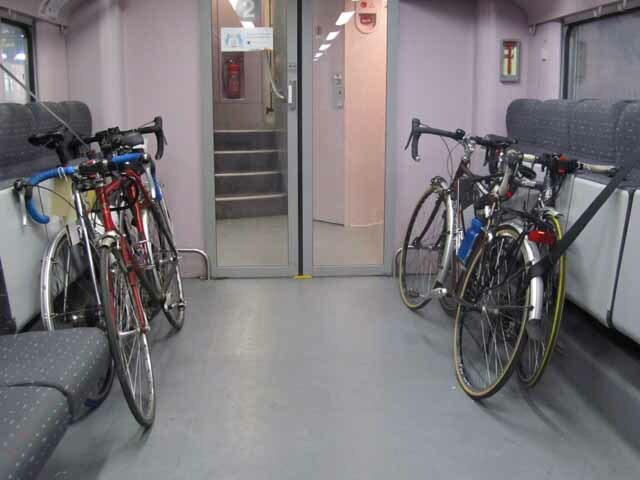 Eventually they relented, and our bikes were accommodated in the Train Manager's office on our booked train. The second problem was that Jim had lost his Eurostar travel ticket. However, this was quickly and efficiently sorted out, as with the booking reference he was able to get a replacement issued at no extra cost. On arrival at St Pancras, we were relieved to find that our bikes were on the train, and we were able to collect them as soon as they had been unloaded. We had time for a celebratory beer in Mabel's Tavern before taking the 17.00 back home to York. It had been an excellent trip, despite the problems on the last day, and will be a difficult one to follow.